MEMBERS of the Henley Hawks observed a minute’s silence for a former player who lost his fight against cancer. 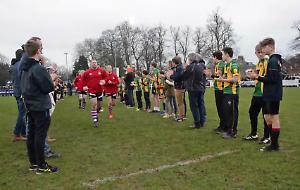 The squad were joined by relatives of James Comben for the short ceremony before their pre-season friendly against Ampthill Rugby Club on Saturday. They included his parents Nigel and Liz, sisters Susie and Christa and widow Elle, née Thomson, whom the 29-year-old fly-half married at St Mary the Virgin Church in Hambleden in June, only two months before his death. Afterwards, the family joined the players for a drinks reception in the clubhouse at Dry Leas. Nigel Dudding, the Hawks’ director of rugby, said: “We decided at the beginning of the week to observe a silence and approached his family about it. “The club was a huge part of James’s life and it’s where he was probably at his happiest so we were keen to pay tribute in some small way and we’re glad we were able to do so. Once the funeral has taken place and things have settled down, we will look at ways in which we might celebrate his life in a more long-term way while including his family. Mr Comben, who lived in Marlow, was diagnosed with a rare blood cancer called lymphoblastic lymphoma in February 2017. He underwent chemotherapy twice and had hoped for a bone marrow transplant from his sister but learned in May that the disease had spread and was incurable. He joined the club’s youth set-up when he was 17 and made his debut in the first team in 2009 before going on to make a total of 167 appearances. He finished in the top five point scorers in the league in the 2014/15 season. The club held a charity day in March which raised £4,500 for Cancer Research UK and Mr Comben attended.